The Sea Hurricane, derived from the famous Hawker fighter, was developed to provide air cover for cargo ships convoys. The first versions were modified to be carried by merchant ships equipped with a catapult for launching the Sea Hurricanes. The ships, however, had no recovery facilities and cranes. The only alternative for the pilots was to find a friendly landing base, if autonomy could allowed it, or ditching. Despite these operating limits, the Sea Hurricane gained the first victories. 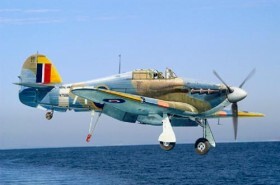 The Sea Hurricane Mk Ib version has been equipped with arrest hook and the fighter could operated from aircraft carriers, such as HMS Furious and HMS Eagle, and from MAC ships, large cargo vessels with flight deck enable to launch and recover the aircrafts. From February 1942, Sea Hurricane Mk Ic, has been introduced. More than 400 planes has been produced and they were used in Mediterranean and Atlantic areas.